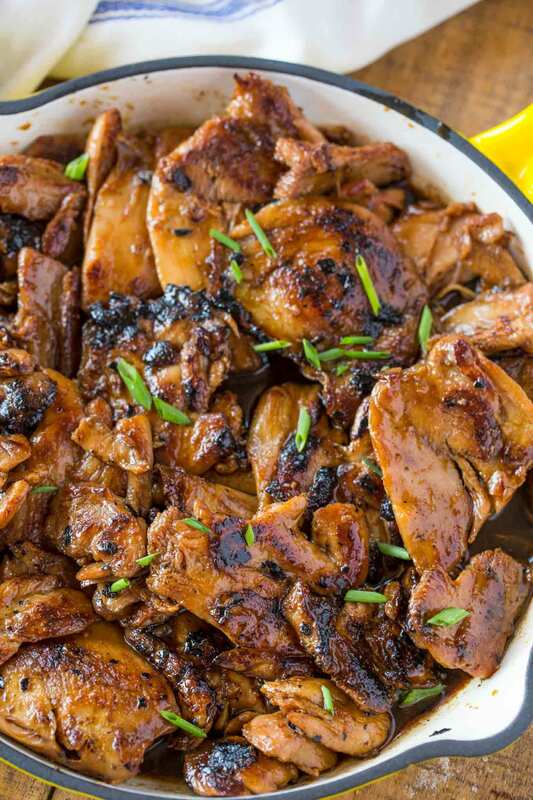 Teriyaki Chicken made with just five ingredients in your skillet that’s as delicious as your favorite takeout restaurant. 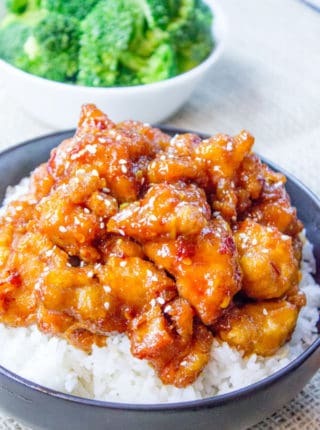 We love classic Asisan Takeout recipes including General Tso’s Chicken, Orange Chicken and Lo Mein and my absolute favorite Mongolian Beef which is another five ingredient recipe. 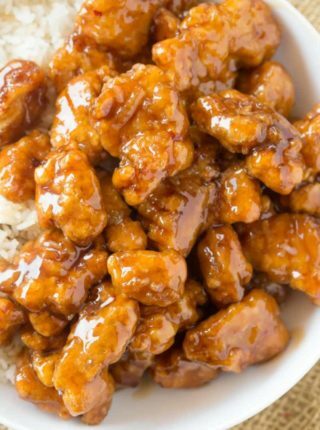 Teriyaki Chicken is one of the classic takeout recipes we all love. No one thinks about how to make it at home mostly because we either have a restaurant we love or because we buy teriyaki sauce like we buy ketchup. But instead of buying it you can make the BEST version of teriyaki ever if you own Mirin and Sake (white wine works too). Japanese Teriyaki sauce that you buy from the grocery store (my go-to prepared variety is this one) is generally either expensive or already reduced or REALLY salty. Marinades are essential to cooking with few ingredients and this marinade is magic. 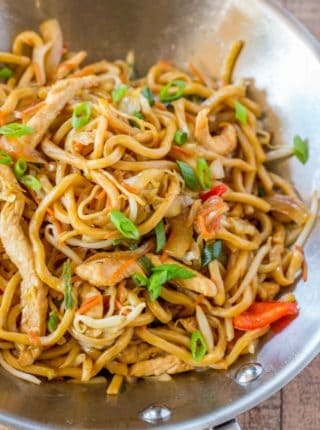 I usually don’t even add the garlic and ginger that I’ve listed as optional unless I have some in the house that needs to be used up and the kids, guests and family all love this recipe. How do you make chicken teriyaki sauce? Teriyaki sauce is a quick mixture of soy sauce, mirin, sake (or white wine) and sugar that is mixed together and added to chicken for 2-3 hours before cooking and being reduced into a glaze. How do you bake chicken with teriyaki sauce? Baked Chicken Teriyaki Can be made using the same soy sauce, mirin, sake and sugar marinade that is added to a baking pan small enough to allow the chicken to bake while being covered by the sauce until it reduces. An 8×8 pan (like this) would be a good fit for this. How do you marinate teriyaki chicken? The easiest way to marinate teriyaki chicken is to add it along with the sauce ingredients to a ziploc bag for 3-4 hours before draining it and cooking. The marinade is then brought to a rapid boil to kill the salmonella and reduce it to the consistency of a sauce. Teriyaki chicken breast: Drain the marinade well and pat dry. Add a bit of canola oil to the pan and sear on medium high heat. Remove the chicken from the pan, reduce the sauce and add the chicken, sliced thinly, back in to coat. Teriyaki chicken wings: Drain the marinade and add to a cookie sheet lined with foil. Cook at 400 degrees for 20-25 minutes. While the chicken is cooking reduce the marinade on the stovetop in a small pan then coat with the cooked wings. Teriyaki chicken stir-fry: Cut the chicken (dark meat preferably) into 1″ chunks and marinade. Drain the marinade and cook the chicken on high heat until caramelized and cooked through (2-3 minutes) before removing from the pan. Add in marinade and let reduce 75% of the way before adding in the vegetables to cook them. Teriyaki chicken legs: Add the legs to a baking pan and cook at 375 degrees for 25-30 minutes.While the chicken is cooking reduce the marinade on the stovetop in a small pan then coat with the cooked legs. 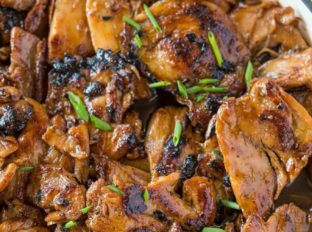 Teriyaki Chicken made with just five ingredients in your skillet that's as delicious as your favorite takeout restaurant. Put all the ingredients into a large Tupperware or resealable bag and marinate for at least 30 minutes but preferably 3-4 hours. In a large skillet add the chicken thighs on medium heat, cooking 4-5 minutes on each side before removing from the pan and adding in the marinade. Let the marinade come to a rolling boil and cook on medium heat until thickened (4-5 minutes) before adding the chicken back in to coat. 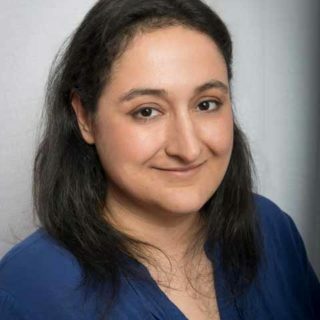 What’s a good sub for mirin? Would rice wine vinegar work? Dry sherry or adding a couple tablespoons of sugar to white wine would be close enough changes. 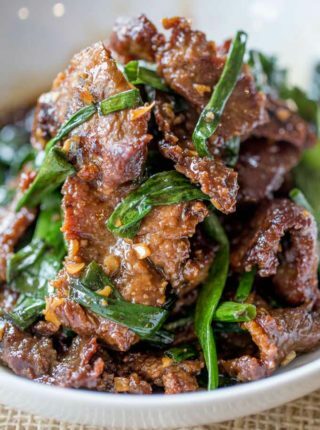 Great recipe, but with what could I substitute Mirin since I can’t get any? 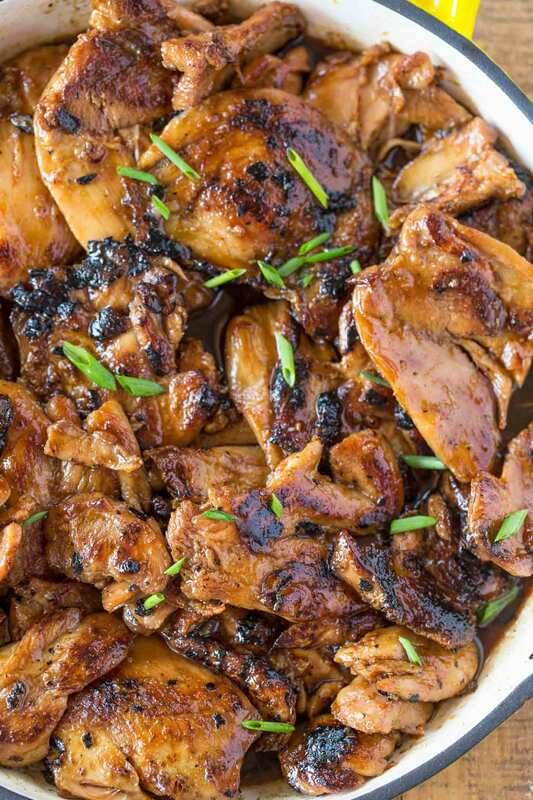 I love teriyaki anything, so I knew I would love this recipe! Delish!! So delicious and easy to make! Love that it uses chicken thighs. this has my mouth watering!! Can you tell me what mirin is? do most grocery stores carry it? https://amzn.to/2QDEgcT Here’s the link to the mirin that I used in this recipe. It’s a sweet tasting rice wine. You can find it in most grocery stores either in the oil aisle or if there’s an Asian section, it’ll be there. This looks SO flavorful! Can’t wait to try it!